Juvonte Reddic wore out Akron inside Thursday night to the tune of 21 points in the Rams’ 88-42 rout. AUBURN HILLS, Mich. – If VCU was trying to get Michigan’s attention Thursday – not just the team, but the entire state – it did a terrific job of shining a light on itself. In a rout for the ages, fifth-seeded VCU hammered 12th-seeded Akron 88-42 at The Palace of Auburn Hills in the NCAA Tournament Round of 64 in one of the most lob-sided games you’ll see in March. It was the largest margin of victory in a 5/12 game NCAA Tournament history and was the most one-sided NCAA loss by a MAC team in conference history. Afterwards, Akron Coach Keith Dambrot could do little but accept a reality colder than the Michigan winter: that the Zips had no answer for VCU. And it was. With VCU’s Havoc defense churning out turnovers, the Rams attacked Akron’s defense – ranked second in the MAC in points allowed and first in field goal defense – with ease. Despite a decided size advantage inside, including 7-foot center Zeke Marshall, Akron could not keep the Rams out of the paint or away from the rim. The Rams got 21 points from forward Juvonte Reddic in 23 minutes and scored 40 points in the paint in all. 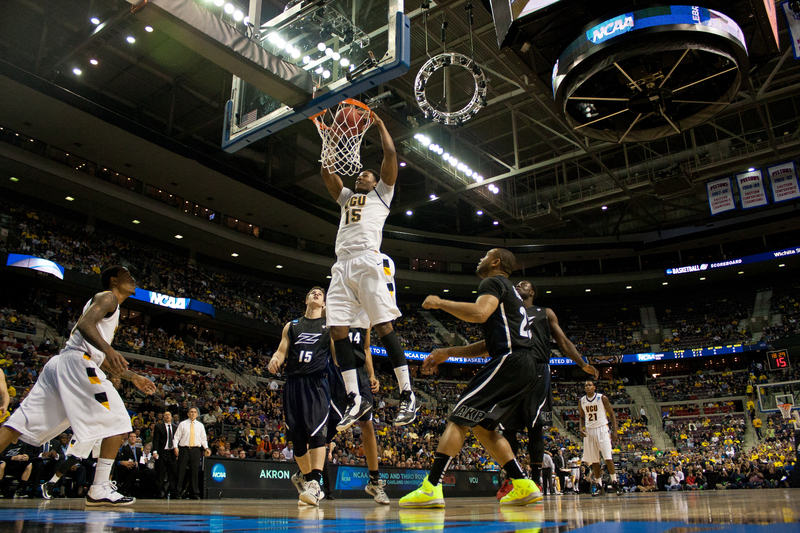 Last season, VCU slipped past Akron in a 76-75 overtime barnburner. Dambrot said he watched the tape of that close loss three times this week and came away convinced the Zips could compete with the Rams. But they could not. Akron’s 22 turnovers – compared to just seven for VCU – allowed the Rams to pile up a scoring 34-7 advantage off those miscues. VCU also outscored the Zips 20-6 on the fast break. It was the 27th time this season the Rams had forced at least 15 turnovers in a game and the 19th time they’ve forced at least 20. When they weren’t wailing away inside, the Rams were watching senior sharpshooter Troy Daniels hurl 3-point bombs. Daniels buried 4-of-5 from deep to start the game and hit six in all. He finished with a game-high 23 points in just 26 minutes. In all, the Rams shot 54 percent (35-of-65) for the game, including 8-of-16 from three. By halftime, with VCU in front comfortably by a 50-25 margin, most of the Michigan fans that remained from the Wolverines’ 71-56 win over South Dakota State earlier decided they could safely go home. They may call it The Palace of Auburn Hills, but by halftime, it felt like a tomb. The Rams finished the Zips off in front of about 1,000 VCU fans and a handful of other stragglers. 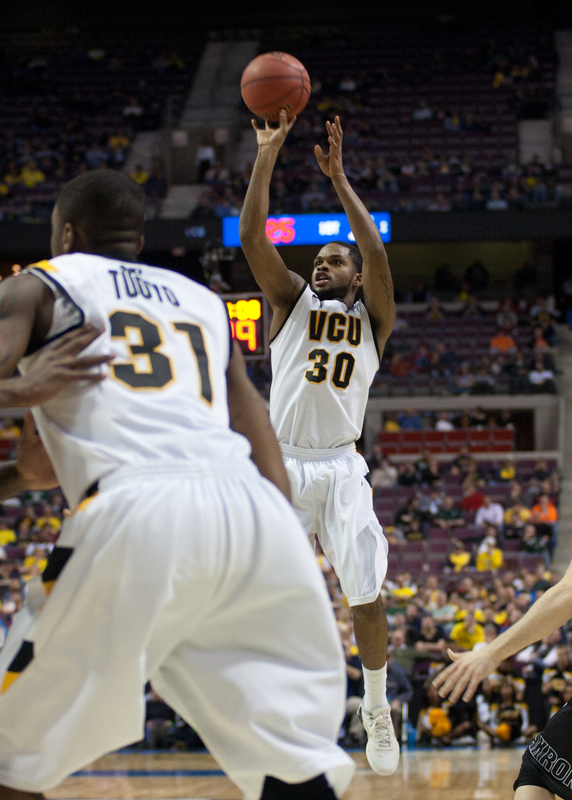 Senior Troy Daniels hit six 3-pointers Thursday and finished with a game-high 23 points. This game was an awful matchup for Akron, which had lost its starting point guard, Alex Abreu, to a suspension two weeks ago. Then, late Wednesday night, starting guard Brian Walsh and reserve center Pat Forsythe came down the flu. Backup sophomore guard Deji Ibatayo also suffered from a bout of back spasms. Ibatayo did not play Thursday night, while Walsh and Forsythe played a combined 12 minutes and did not score. The absence or limitation of those players was certainly a contributing factor in Akron’s demise, but as the game drew on, it became clear that Abreu, Ibatayo and Walsh at full strength would have merely altered the final score, not the outcome. It didn’t matter if Akron had Alex Abreu or Alexander the Great. VCU wasn’t losing this game. The Rams dominated in the areas they were expected to, limiting Akron’s three top guards, Walsh, Jake Kretzer and Carmelo Betancourt to a miserable 0-of-11 combined shooting performance and eight turnovers. Inside, VCU showed little hesitation in attacking Marshall and the 6-7 Treadwell, and the Rams outrebounded the MAC’s best rebounding team 36-29. Five, 10 years ago, this win would be cause for great celebration, but it’s become clear that success at VCU is no longer judged by a single NCAA win. Under Smart, the Rams have set a new standard. VCU’s victory Thursday marked the third straight year the Rams had won an NCAA game, an accomplishment reached just once previously in program history (1983-85). Smart, who is now 7-2 in the NCAA Tournament, demands more than one act. Fourth-seeded Michigan awaits here Saturday at 12:15 p.m. Auburn Hills is just an hour from Ann Arbor, and thousands of Wolverines’ fans flocked to The Palace for Thursday’s games. On Saturday, the Rams will be faced with a decidedly pro-Michigan crowd, not to mention potential NBA draft picks Trey Burke, Tim Hardaway Jr. and Glenn Robinson III. But if VCU wanted to fire a psychological shot across Michigan’s bow Thursday night, a 46-point blowout was a good way to go about it.